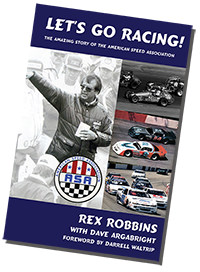 For more than 30 years Rex Robbins and his American Speed Association were an integral part of the auto racing landscape. This is the fascinating story of how a humble man with no racing experience led a loose-knit bunch of regional racers to become a stock car racing powerhouse. Along the way ASA forever altered the short track racing landscape. Rex finally opens up to share the stories behind the story...insightful, illuminating, poignant, and sometimes downright hilarious. Throughout the years the people of ASA attracted a large and loyal following. Rex describes the trials and tribulations, the wins and the losses, and the memorable people who made it all possible. This book is required reading for anyone in the racing business today: track owners, promoters, officials, car owners, drivers, manufacturers, members of the media. The lessons Rex shares here are timeless and unforgettable. The book includes a comprehensive listing of ASA events from 1968 to later years. "I'm very proud of this book," says co-author Dave Argabright. "Rex remains one of the most astute leaders in the history of the sport, and his words should resonate with today's leaders. His career was spectacular, and through three decades he worked with a who's-who of auto racing. It was very important that this story be told, and I'm proud to help Rex tell it." ASA fans...this book is for you. But not just for you; anyone who loves racing will find these pages highly-entertaining. List price $32.50, direct price $29.95 -- SALE PRICE: $14.95!